It's your day, You have planned and waited. Top it off with a horse and carriage. Have you considered an outdoor wedding? Take a look at some the pictures from a recent Wedding held at a beautiful park. add one more personal touch to your special day. Vacation Bible School, Picnics, Television. Add the horses for your special event. Call 816.531.1999 for quotes. 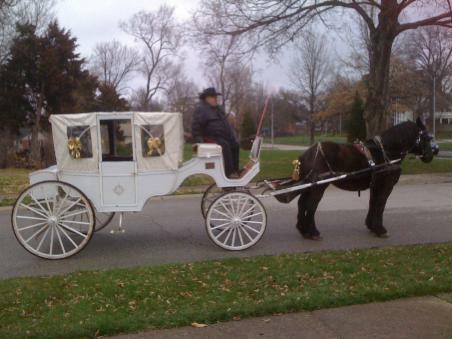 ANY CARRIAGE RIDE CANCELLED DUE TO THE COMPANY NOT OPERATING DUE TO INCLEMENT WEATHER WILL RESULT IN A GIFT CERTIFICATE BEING ISSUED VALID FOR ONE YEAR FROM DATE OF RESERVATION.